What is the legacy of a civil war, specifically one that lasted over a decade from 1990 in El Salvador? Family members are “disappeared” or forced to migrate to other countries. Thoughout the upheaval, people try to maintain connections between their old and new lives. Los Angeles was the locus of a large migration of Salvadorans during that war and a small show at The Mistake Room in downtown L.A. shows how that manifested in one family of artists. and The Mistake Room, Los Angeles. 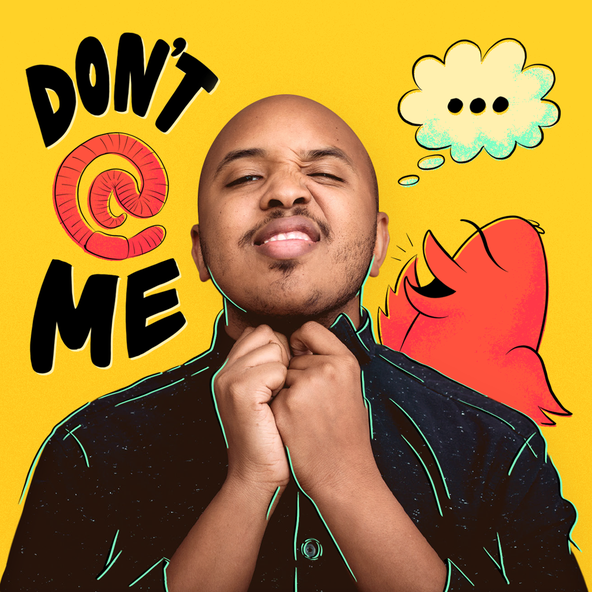 My Veins Do Not End In Me, a compelling title drawn from from “Like You” a poem by the Salvadoran poet Roque Dalton, is primarily anchored by the art of Eddie Rodolfo Aparicio (b. 1990, Los Angeles). The show also includes art by his father Juan Edgar Aparicio (b. 1954, El Salvador) and his paternal grandmother Maria de la Paz Torres de Aparicio (b. 1917, d. 2000, El Salvador). Viewed collectively, the show reveals generations of cultural connections retained despite enormous adversity. 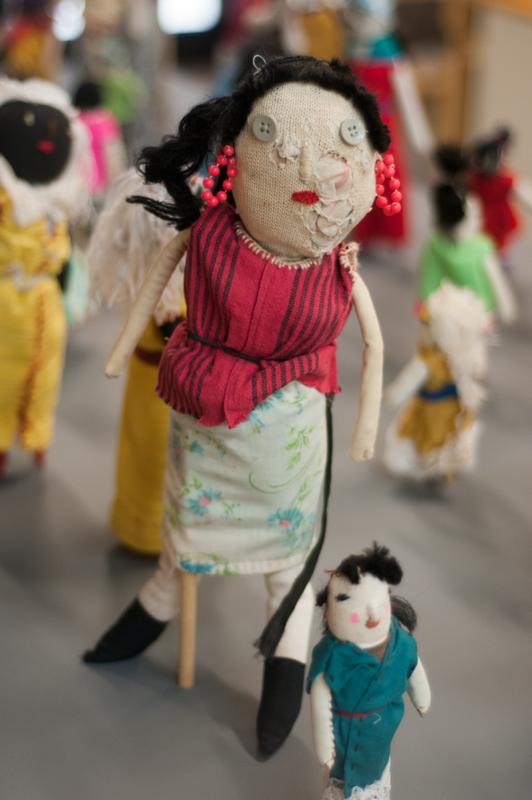 Maria de la Paz Torres de Aparicio, Untitled dolls, 1994-2000, Mixed media. 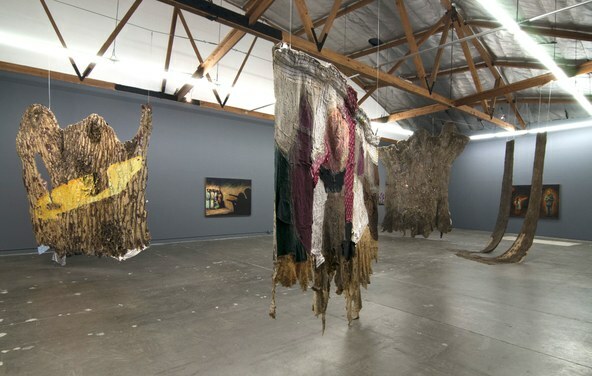 Multiple hangings of large sheets of latex imprinted with the patterns of tree bark on one side and fragments of old clothing on the other dominate the space of the non-profit gallery. 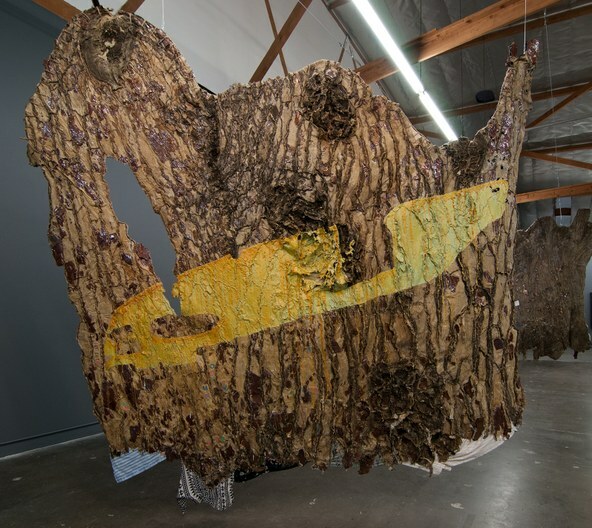 Eddie has taken the surface impressions of trees in L.A. neighborhoods that were meaningful to him and the Salvadoran community while the clothes symbolize the personal items left behind in the course of migration and political upheaval. As works of art, they make a big impression. The artist has an MFA from Yale so they are far from being simplistic craft. As paintings, they reference multiple layers of abstraction and process-oriented art while exemplifying meaningful personal and political content. The walls of the gallery are hung with the art of his father, Juan Edgar. 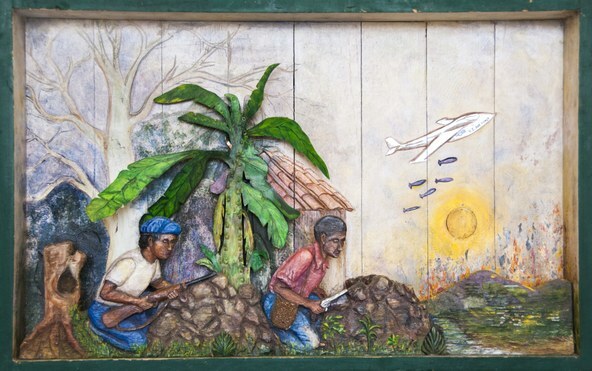 Mostly, he has made carved and painted reliefs documenting a history of brutal warfare and repression. 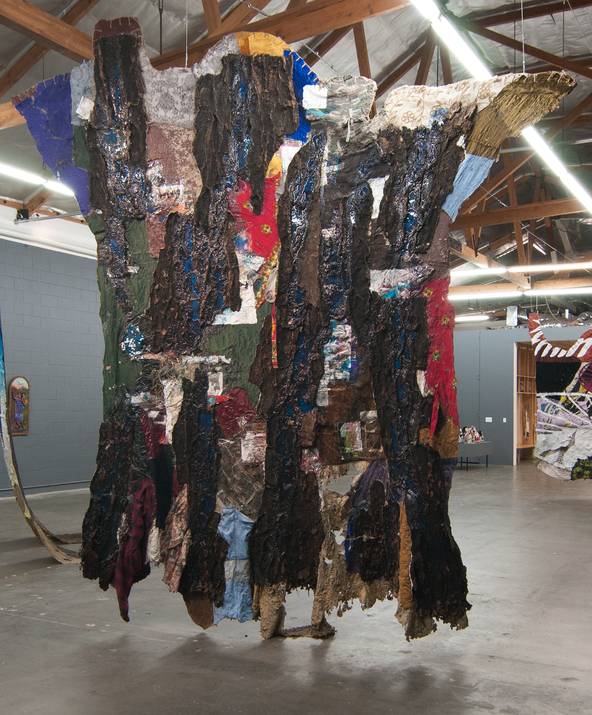 He studied architecture and economics at the National University of El Salvador before having to flee the country after his brother, wife and daughter were “disappeared.” An artist and activist, he has worked in L.A. with a community arts organization at Casa Amigos. He now lives in El Salvador. 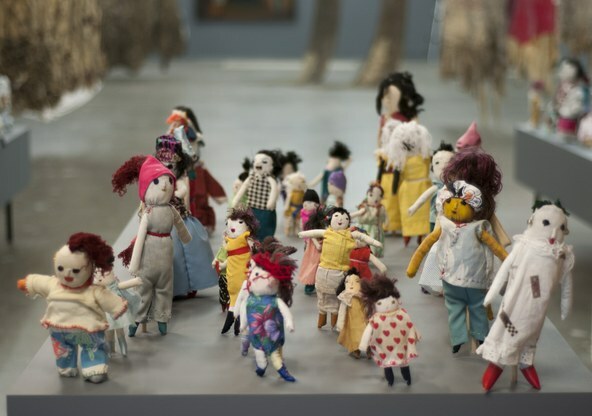 The show also includes two of his small paintings of innocent dolls in distress, a reference to the dozens of individual rag dolls made by his mother Maria. On large pedestals in the gallery, dozens of the little dolls are posed together, each with its own distinct personality and charm. For years, they were sold in the U.S. to support the family and to send money back to El Salvador. Los Angeles, CA, 2018. Image: Courtesy of The Mistake Room, Los Angeles. The exhibition, organized by TMR’s Nicolas Orozco-Valdivia and Cesar Garcia, does so much more than highlight one artist’s talent or vision. Without resorting to the megaphone approach, the show relays the experience of an incomprehensible brutality and the ability of one family to carry on. The show continues to Aug. 25 but this Saturday, August 11 at 11:30, a panel discussion on Salvadoran Art and Activism will be held at TMR. 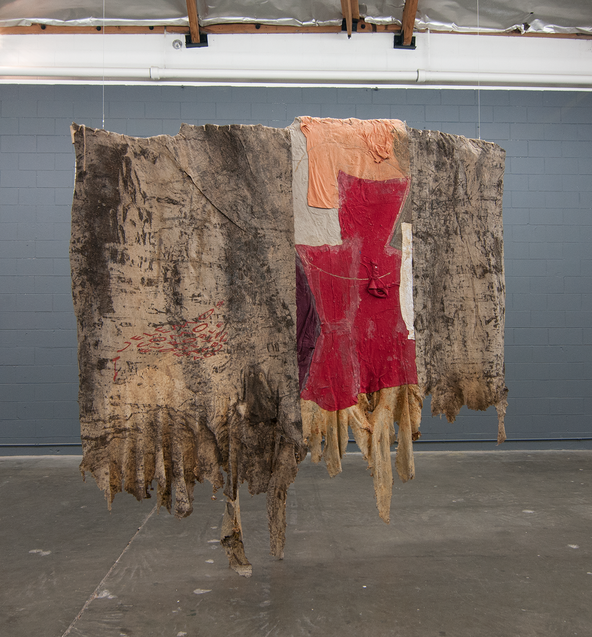 Blvd., LA, CA), 2018, Rubber, sulfur, tree and paint residue, and wood glue on cotton. Image: Courtesy of the artist and The Mistake Room, Los Angeles. of the artist and The Mistake Room, Los Angeles.